Mrs. Flanagan gave us pictures of animals. In the chart on the left, we predicted which ones would be oviparous (came from eggs) and which ones were not oviparous. Then we read the book, "Chickens Aren't the Only Ones". Afterwards, we moved some of the animals around. We brought in hard boiled eggs and used them for math activities to complete the paper shown above. First, we predicted how many squares our egg would cover. Then we traced around the egg to see if our predictions were accurate. Next, a line was drawn on a cup to mark the water level. 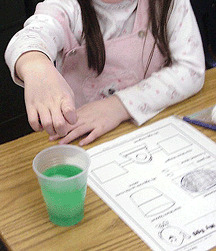 Colored water was poured into the cup to this line. Then we put our egg in the water and we found out how much space our egg took up. We marked the water displacement level with a marker. 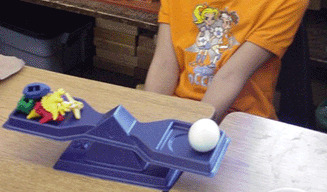 Finally, we tried to balance our egg using some little math counter manipulatives. We wrote down how many of these it took to balance our egg on the balance scale. What is in the Egg? Format: PDF ~ Download NOW! 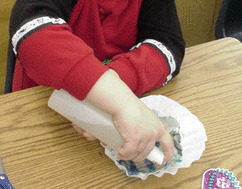 We colored a coffee filter with markers and sprayed it. This made the colors run together. After cutting and folding them, they became the umbrellas for our ducks. This chick was made by cutting slits in a pear-shaped piece of yellow construction paper. Feathers were inserted into the slits and taped on the back side. 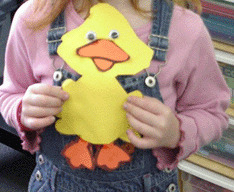 We read a book called "The Chick and the Duckling". Finally, we made a Venn diagram comparing chicks and ducklings. At this center, every student's name was in a different egg. 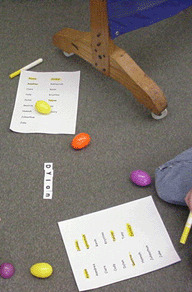 We had to open the egg, look for the capital letter that begins the name, put the letters in order and then highlight the name on the list. This was an "eggdition" center. 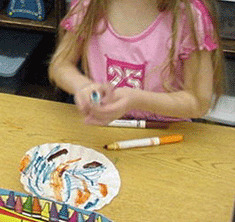 Rabbit erasers were in the white eggs and carrot erasers were in the orange eggs. We wrote down how many rabbits were in the egg, how many carrots were in the other egg, and how many there were altogether. 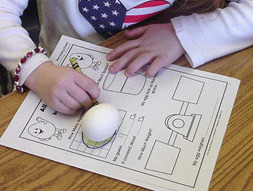 The students would write the numbers inside the egg shape on the recording paper. Our show and tell had to fit in an egg. Then we gave clues and our friends tried to guess what was in our eggs.